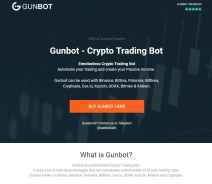 Gunbot is a cryptocurrency robot that is created by someone named “GuntharDeNiro”. It is said to be working with different exchanges and since you have to buy a license, it is not a broker affiliate like most other scam robots. But what exactly is it and how does it work? Most importantly, I believe you wonder whether this is yet another scam or a robot that can actually help you make money. I have to say, at first sight, this robot does not give me the typical scam impressions so let’s see if it’s worth buying or not! Gunbot – What is it? 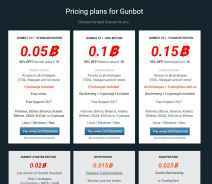 Gunbot is a robot that comes with a variety of “strategies” or settings if you wish. Do not mistake this for a set it and forget it robot that can make you rich with a small deposit while you are getting a tan on your vacation. I went through the reviews from actual clients found on forums such as Bitcointalk and Reddit and this involves tweaking, monitoring and changing the strategies and also knowledge about cryptocurrencies and charting. Some people were even talking about coding and I was completely lost. 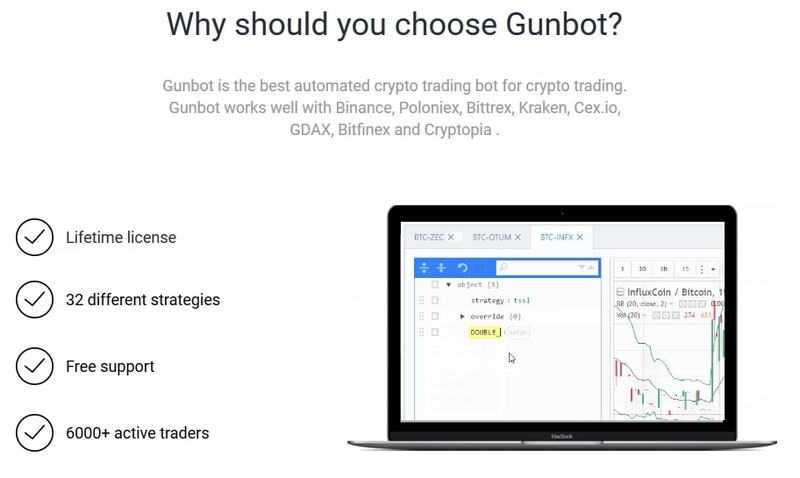 Overall, if you know a thing or two about cryptocurrencies, you know which levels you want to sell or buy and you want to automate your strategy, then Gunbot could be a helpful tool. That’s right, if you see it as a tool rather than an easy money robot, then you have the correct mindset. For example, say you want to buy ETH at 400 dollars and every time this happens, you want the robot to buy it for you on all the Gunbot supported exchanges you have funds. Then you set it to sell for you at a higher price, say 600. Simply put, people are using it to buy low and sell high with their own settings. The settings can be RSI levels, price levels, stop limit and take profit, volume and more. In the advance mode, you also have the option to put in your own lines of codes. When it comes to robots, so far 99.99% of the ones we have reviewed here have been pure scams. Gunbot seems different though, they do not work for the typical unlicensed brokers or any brokers at all. In fact, the robot works with the very known and prominent exchanges such as Poloniex and Bittrex or Kraken and others. Another indicator that this is not your standard broker affiliate scam robot is the fact that the company makes money from selling the robot and not from sending people to any brokers. This and the other fake reviews are what you will find on the Gunbot’s reseller websites. No robot is a money machine, that’s a fact. In this case, it is clear that it’s not a money machine because as I mentioned above, it depends on your own experience, knowledge, and strategies used with the robot. So this is not a “set it and forget it” robot that’s gonna pile up cash for you overnight. Any such offer is always “scammy” or at best, awful marketing. But, I will let this slide since the other things look legit. When I normally review a robot, I keep finding more and more lies and more and more nonsense. With Gunbot, it seemed to be somewhat the opposite. While most services don’t offer more than an email address to contact them, Gunbot offers live chat through Telegram and Facebook. But unfortunately, my optimism was cut short when I saw that the images of their team are also fake. I am pretty sure their names are fake too but the images are stockphotos which you can easily find on Google. This is very unprofessional. By the way, there is no information on the company either. No address, no company registration number on neither of the Gunbot reseller websites. Upon further investigation, I found out that the actual creator is known as “GuntharDeNiro” who appears on Github which is a software development platform. And no, there is not much information on this person on that platform either, it’s just a nickname. But hey, you can always hit them up on their Telegram or Facebook and grill them with questions! Which is exactly what I did for you. photos are fake, names are probably fake too. The telegram support answered within a minute which is awesome and didn’t try to sell me anything and didn’t ask for my phone number and my soul which is what a lot of bucket shop brokers do. They told me I can get more info on the creator on Gunthy.org. So I followed the tracks and indeed that is the creator. It turns out they sell other types of robots and tools such as mining and Gunbot Reversal Trader to name a few. In conclusion, the trail does leave somewhere which is a positive thing. Put the Gun Down or Not? First things first, Gunbot is not a scam. I watched several videos on YouTube of people using it and it is certainly not another easy money machine. It’s a platform with a lot of features that are helpful if you KNOW what you are doing! If you know how to read charts if you know how indicators work and you are not a clueless newbie – then it can be a helpful tool. I also looked through forums and no one reported that they had lost money. In fact, some people reported smaller gains but again, these were the people with their own strategies. People who knew when to trade what and how much and based on what rules. The robot is just a helpful tool for your strategy and skills and how much you can earn depends on yourself so if you have a great strategy and need help with the execution then perhaps you should try it. If you are a beginner, then spend time on education and charting and forget about robots.